A by product of 10 million years of volcanic activity, the Cappadocia region of Turkey was once where early Christians hid from Roman persecution. 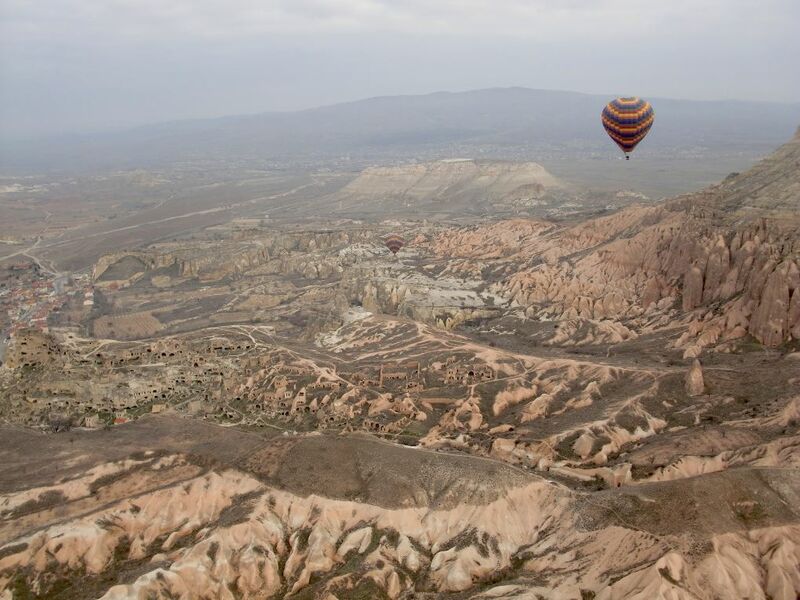 Now, the area outside of the Turkish town of Goreme sees 2.5 million tourists a year, drawn by ancient dwellings above and below ground, phallic rock formations, and famous hot air balloon rides. The day before I hopped into a similar balloon, in one of the most popular skies in the world to do so, I was lost and wandering on top of those rock plateaus. That’s because I was following this little guy, a stray guide dog who kept running up and back along the trails in a manner my human senses translated as “follow me”. Now some of the hostels and hotels in the area do have guide dogs for guests along with rumors of knowledgeable strays leading people along the hiking trails. Either this little white dog was not one of them, or the muddy paths blocked by trees forced him to come up with alternatives better suited for a canine, not an ape with no sense of direction. Although at one point I was more convinced than not I’d be sleeping in the unofficial open air hotel of Goreme, I eventually found my way down from the rock plateaus, approximately 100-150 meters above the surrounding valley. After the hike to Cavusin, you can catch a local bus to the larger town of Avanos and eat at one of the plentiful Turkish pide restaurants to recharge as I did. The balloon rides themselves cost about $150 for the well timed one hour trip. Keeping things interesting the pilots also have a knack for lowering the hot air balloons in between the rock formations before taking you back up just under 500 meters (~1,600 feet). At that altitude you’ll get a view to appreciate even more if you hike the paths on the ground first. Then take to the skies to see everywhere you hiked with Cavusin and Avanos in the distance. A hot air balloon ride over Goreme is one of those tourist attractions that is popular you can’t help but expect disappointment. Yet, after you land, you realize why so many each year tightly squeeze into baskets with 15 other people, in aircraft that lack steering. You can see the rest of my Goreme photos here. Amazing! I love the perspective of the first photo. And crazy how the operators can lower you into the formations… I look forward to doing this myself someday. It’s really surprising to see them do it and how nimble the pilots can be with those huge balloons. haha, he was quite the actor with the little head turn at the end! I quite enjoyed the underground and was amazed at how such construction through the rock could be done with out the aid of modern mechanics 🙂 I hope to have some more about it somewhere down the line! The balloons have a 500 meter limit so they don’t cross anywhere near where airplanes are allowed to fly – so they float in the 495 range 🙂 It did take me a good 30 minutes to loose that anxiety of being in a basket so high though! Such incredible views! I’ve only been in a hot-air balloon once when I was a child and I don’t really remember it. I’m afraid of heights in some situations and don’t think that I’d do very well up there, but for this scenery, the vertigo might be worth it! I think it’s worth the views and to make you feel a bit better about it – it’s not so scary by the end of it 🙂 Thankfully…because I don’t like heights myself! Wow, looks like you had a stunning perspective. I want to go on a hot-air balloon ride now! The operators certainly make an effort to give you a variety of perspectives. Excellent photos Anil! Ahhh to go back in time! Lovely photos. I bottled out of doing the hot air balloons. Went to the take off ground in the morning but my fear got the better of me. Not sure if I am glad I made that decision or not but got peace of mind that if I feel I made the wrong decision, I can go back any time I want to. I hope to go there someday soon! The pictures are great, I can only imagine how great it is seeing it in person! A balloon ride is one of my favorite travel experiences. 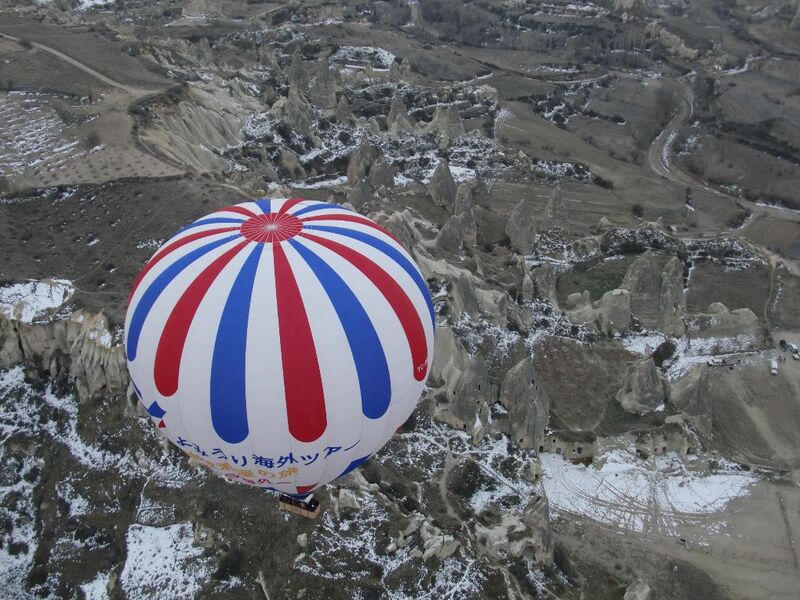 I’d love to do this one in Cappadochia. Beautiful photos, Anil. Beautiful pictures. We left Cappadocia a few days ago without taking a balloon ride but I still enjoyed sitting on a hilltop watching them take off. Until our last day in Goreme we didn’t see many balloons in the sky. Then the weather cleared and we had the pleasure of watching eight in the sky at once. I was surprised at how many were up there at the same time myself. I agree though, beautiful view with so many floating peacefully above. Did you try the wine though?? Funny you should mention the wine. I’ve just thrown away the remains of an opened bottle I’d been carrying around for the last 5 days. It didn’t travel well in that state but otherwise Cappadocian wine isn’t bad. I recommend, though, that you try Lebanese wine when you reach that country. It’s a wonderful place to hot air balloon, have you done it before elsewhere? Really would like to try the hot air balloon ride but I bet it could get a little scary when they lower it between the rocks. $150 for a 1 hour ride seems like a really great price. Thanks for the video. 15 people in a basket…wow! The only time I took a balloon ride we only had 5 people! The photos are stunning and I love your new wide post format! It was a bit crowded in there and at first I wasn’t 100% with it. Tight spaces in high places can do a number on you! What planet is this? Or is it just science fiction?? The view from the sky is absolutely spectacular… so much to see in the region! 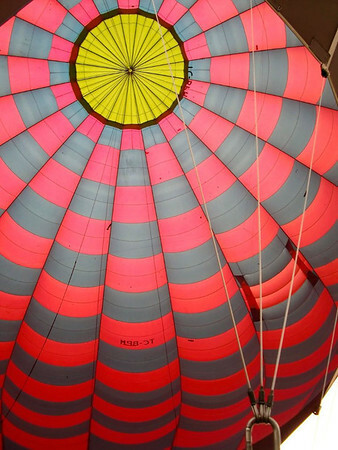 I spent 5 days in the region, had my own experience, but didnt do the hot air ballooning. Looking back, I wish I had. Even though it was ridiculously expensive for an hour!